When working out is a part of your busy schedule, you need to get in and out to keep your day moving. That’s likely one of the main reasons that you’re searching for the best ellipticals of 2018. Many people may be confused as to what features to look out for in ellipticals. But that’s why we’ve created this review guide. All of the information that you need to know about the eight best ellipticals of 2018 can be found below. 1 Why Is It Important to Find the Perfect Elliptical? 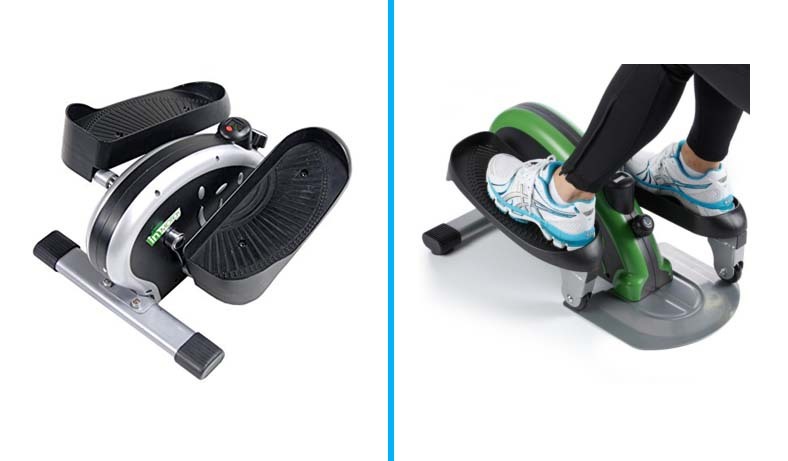 2 How to Choose the Best Elliptical? Why Is It Important to Find the Perfect Elliptical? Getting into the routine of exercise can be a challenging task. You know that it’s beneficial as it helps you lose weight to look and feel better, as well as become healthier overall. But forming the habit of remaining consistent with working out is tough. That’s why it’s vital that you find the perfect elliptical for your specific needs. If you don’t exercise on the right machine for you, sticking to an exercise routine will be harder. However, picking an elliptical that tailors to you are going to make the entire process a lot smoother and enjoyable. How to Choose the Best Elliptical? Choosing a great elliptical that suits your needs can be tricky. There are many things you will need to consider. However, if you follow the tips listed in this article, you will feel more confident when buying one. The flywheel is the most important part of an elliptical. So, don’t settle for a low-quality one. A general rule of thumb; the heavier the flywheel the smoother the elliptical will operate. It is recommended that you choose an elliptical that has a flywheel that weighs at least 7 kilograms. As far as the resistance levels are concerned, you should choose an elliptical that has a wide range of resistance adjustments. In this way, you will have more options to adjust your workout intensity from the lightest to the toughest. Most ellipticals come with a number of preset exercise programs. Some ellipticals allow you to personalize those programs as well. Those are very useful as they allow you to train in a less boring way. The more the preset programs, the more versatile your workout sessions will be. Custom programs are also important as they allow you to set your own training goals and adjust your workouts according to your preference. There are a number specific features you need to consider when it comes to console. First of all, make sure to choose an elliptical that has a backlit console. A non-backlit console can make your workout stats very difficult to read, especially in low light conditions. Also, a console should give a constant feedback of your physical and workout stats and shouldn’t toggle back and forth. Another thing to consider is that it should have an easy-to-reach start and stop buttons. 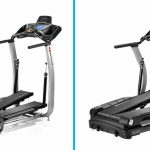 Ellipticals can take a lot of space and this is an important factor to consider, particularly if you have limited space. 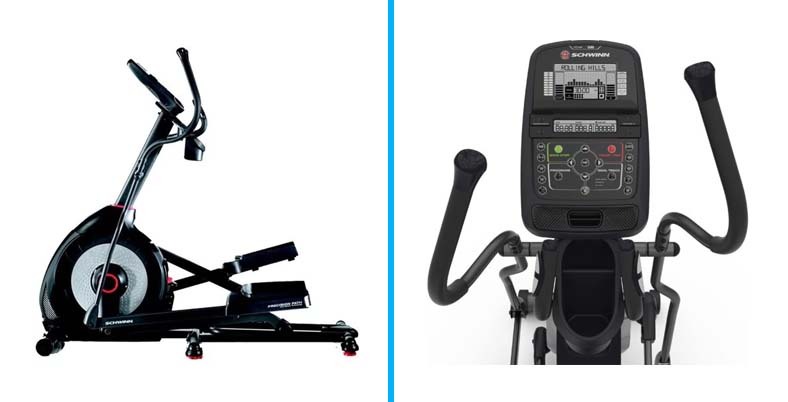 While there are a lot of ellipticals on the market that have compact size e.g. Bowflex M3, M5, etc., there are some that have a relatively larger footprint. The position of the flywheel (back or front) also affects the space occupancy of an elliptical. So consider this factor as well. 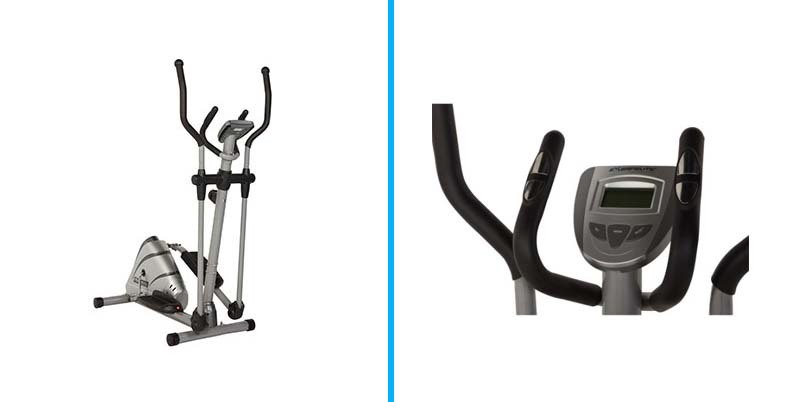 If you are serious about improving your cross training skills, then it is recommended that you look for an elliptical with features and enhancements like adjustable stride, motion tracking sensor, heart rate monitoring, upper body poles, cross-ramp inclines, tablet holder, water bottle holder, etc. However, keep in mind that the more the enhancements, the higher the price of the elliptical will be. Although an elliptical that costs under $1000 will not have a longer warranty period as compared to the high-end models, you should still have some expectations. It is recommended that you ask your retailer regarding which parts of the elliptical are covered by the warranty. We’re about to review the top eight ellipticals in 2018 below. Be sure to read through all the features, as well as the pros and cons of having a full understanding of each machine. By the end, you’ll be left with a much clearer picture of which elliptical is best for you. The Bowflex Max Trainer is the elliptical that we recommend for most people. It comes with a ton of workout programs that enable you to burn more calories, faster. It has special designs and is especially beautiful. We liked how you’re given the opportunity to choose between a total of 16 resistance levels as you can find the ones that are perfect for your goals. We were also impressed by the nine workout programs built-in. We are fans of the Calorie Burn program as it allows you to burn a remarkable 280 calories within just 15 minutes. The Steady State program is great for burning calories over a longer period of time. It’s less intense, which suits some people better. All in all, this elliptical offers you everything you need to burn calories faster. It’s also packed with numerous accessories too. These include cup holders, heart rate monitors, and large foot pads for completely stable exercise. It’s pleasant and simple for both beginners and advanced users. The Sole Fitness E35 has been created with the help of physical therapists and engineers. As a result, you can be sure to experience intense exercise on an ergonomic machine that feels comfortable to use. The incline can be set anywhere from zero to 30%. You can easily adjust it to make your workouts more challenging. Moreover, there is a total of six workout programs available. Therefore, you can be sure to pick one that fits your workout goals. Alternatively, you can also set two custom programs for yourself. We liked this feature as it provides you with a very personalized workout setting. To monitor your progress accurately, there are also two heart rate programs available. All these programs can be selected on the large 7.5 display. Overall, we recommend this elliptical for those wanting to exercise with a smooth machine that allows you to personalize your workouts to a tee. If you’re on a tighter budget and need a high-quality elliptical, the Bowflex M3 could be perfect for your needs. 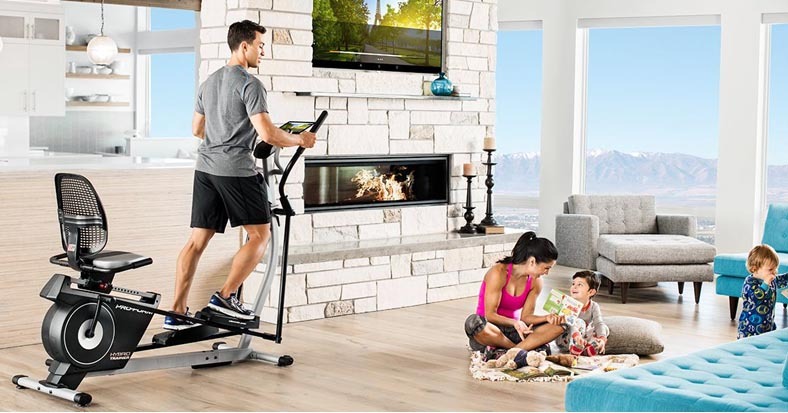 Since this Bowflex M3 model is available for under $1,000, it won’t come with as many features compared to the higher end ellipticals. But considering the more affordable price, you’re still provided with great features to experience effective workouts. There are 8 resistance levels to choose from. These can be adjusted to allow for more control over your workouts. You can also select between two workout programs. The MAX Interval program is our favorite as it allows you to burn over two times the number of calories compared to other ellipticals. You can get an awesome calorie burning workout completed in just 15 minutes. We also noticed the ergonomic handlebars provide you with various grip positions. This increases comfort and improves the exercise experience. So, there aren’t as many technological features with the M3 compared to the two ellipticals above. But if you’re on a budget under $1,000, you can still get incredible workouts while using this machine. You can easily measure your heart rate by a chest strap. This elliptical is awesome if you’re stuck behind a desk all day and need to find a way to stay active. The Stamina In-Motion Trainer simply fits underneath your desk for you to use throughout the day. We liked how versatile this elliptical trainer can be. Not only can it be utilized under your desk while working – you could also use it while watching TV or reading a book during your free time. You can also use it standing up to make the workouts more challenging. This involves your core a lot more to remain stable. A monitor is attached which lets you track your progress effortlessly. Furthermore, you can use the knob to adjust the tension to your exact preferences. You can also be sure to workout in silence as this elliptical produces no noise. It’s an extremely affordable elliptical that has a limited number of features. However, if you’re just using it to increase your activity during the day at work or at home while sitting, it’s an awesome option. Nautilus is a very reliable and well-established brand that has made incredibly innovative pieces of equipment. 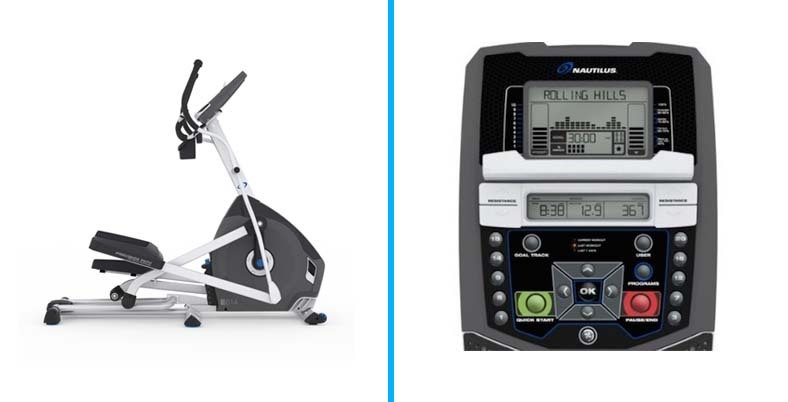 The E16 Elliptical fits right into that line of products that they’re known for putting out. The Nautilus E16 provides you with 22 workout programs. As a result, you can pick out the one that suits your goals best. You can choose between a total of 20 resistance levels too. Not to mention, it comes with an incline feature. Therefore, you have complete control over how difficult you make your workouts. The LCD displays enable you to see all the information about your workouts to see where you need to improve. There are even integrated speakers that let you listen to music and workout. Considering that it’s under $1,000, you get a lot of features to experience that enhance your workouts. It’s durable and comes from a trustworthy brand for your peace of mind. 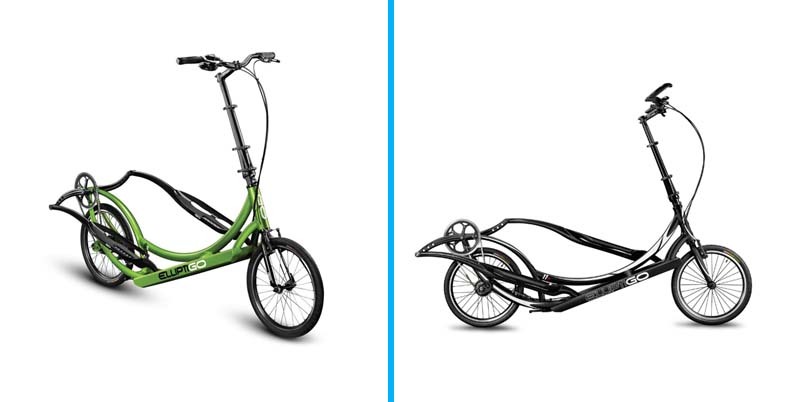 The Elliptigo 8C bike is one of the first elliptical bikes ever. It’s a fantastic choice if you’re looking for a low impact form of exercise that you can enjoy outdoors. We found this unique elliptical machine combines fun and exercise seamlessly. Since you can ride it outdoors, you’re able to experience more and ride around different areas. It’s also a fantastic option for people who commute back and forth from work every day. You can reach high speeds of up to around 25 mph for the more intense workouts. Alternatively, you could choose to ride for longer at lower speeds. Climbing up hills with the ElliptiGo is something that people love doing. It adds another challenging element to the workout that’s still low-impact. You can also select the eight gears available to find the most appropriate one for your riding condition. The portable features that are built-in to this elliptical are excellent. There are quick-release levers that let you fold the machine into a more compact size. Anyone wanting a fun way to exercise outdoors would prefer this elliptical over the others mentioned in our review. The Schwinn 430 has proven to be a very reliable elliptical machine that provides you with a variety of workout programs and accessories. We found this Schwinn elliptical to be among the most affordable machine that used a front-drive mechanism. There is an LCD display that’s 3×5” in size. It provides you with all the information you need to know about your workout progress. This includes the calories burned, time, distance, and resistance. You can also easily see your heart rate by holding onto the handles for around 10 seconds. You have the option to use incline settings too. They are manual, meaning you have to stop your workouts and adjust the incline. Nonetheless, it’s a great way to add a more challenging aspect to your workouts. The 20 resistance levels can easily be adjusted to ensure you can select the right one for your needs. Not to mention, the 22 workout programs that are available. This is an impressive range of programs, so, you can be sure to find the one that helps you reach your fitness goals the best. With the pre-set workout programs and adjustable incline and resistance levels, we feel confident in recommending this one for people who want to workout with an affordable front-drive elliptical. Are you looking for a high-quality elliptical for under $500? If so, you’ll be interested in what the Exerpeutic 1000XL has to offer. The LCD display clearly shows you the speed, time, calories burned, and distance traveled. So, you can see your progress each time you workout. There are even heart rate monitors on the handlebars. These let you see your heart rate and set a target zone goal to burn fat. The eight levels of resistance can be easily adjusted. Therefore, you can pick the best resistance level according to your fitness goals. We appreciated how this elliptical machine can operate in silence. As a result, you can set it up in front of the TV and not have to worry about the noise is a nuisance. Anyone needing an elliptical machine for below $500 will be left very satisfied with the features that the Exerpeutic 1000XL Trainer has available. You now have a better idea of what some of the best ellipticals of 2018 have to offer. 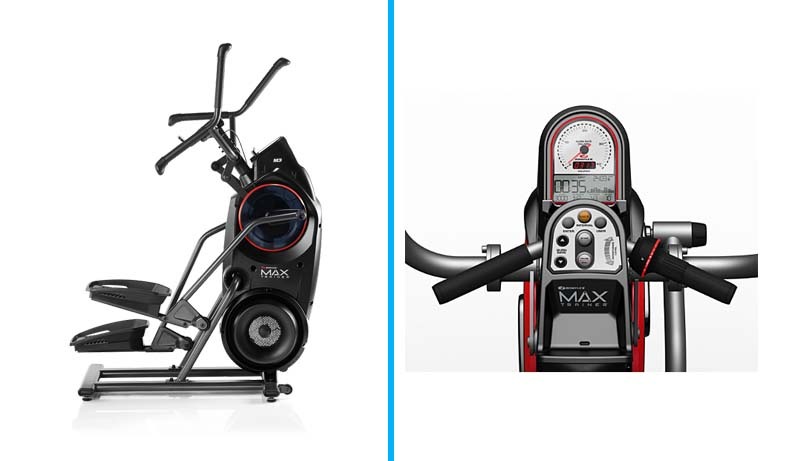 We recommend the Bowflex Max Trainer M5 the most due to the remarkable number of calories that you can burn with it. It also comes with many excellent features that enhance the workout experience. 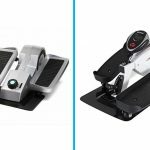 Having said that, be sure to consider all the features, advantages, and disadvantages of each elliptical in this review. 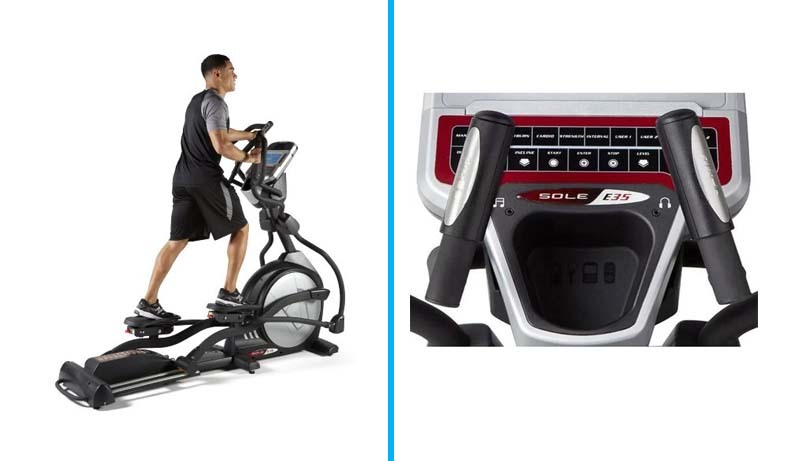 Use the information we’ve provided to help find the best elliptical machine for you.